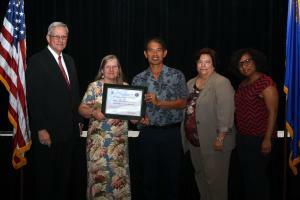 (Honolulu) - Honolulu Community College (HonCC) received its redesignation as a National Center of Academic Excellence in Information Assurance/Cyber Defense for Two-Year Education (CAE2Y IA/CD) at the Colloquium for Information Systems Security Education held in Las Vegas, Nevada this summer. HonCC is now one of only 31 junior and community colleges nationwide to hold this distinction. The CAE2Y IA/CD program, which is jointly sponsored by the National Security Agency (NSA) and the Department of Homeland Security (DHS), recognizes colleges and universities that have met their standard of excellence, in providing quality cybersecurity awareness, training, and education to the community. Honolulu CC’s Computing, Electronics & Networking Technology (CENT) Program Coordinator, Sally Dunan and Technical Coordinator, Aaron Tanaka accepted the honor at the national awards ceremony. “Having the CAE2Y designation has opened the door to key industry partnerships that our students and the program will greatly benefit from,” shares Tanaka. As part of HonCC’s continued mission to be a premiere technology training center, the CENT program has partnered with the University of West O‘ahu to offer a Bachelors of Applied Science Degree in Information Security Assurance that was launched in the Fall 2013 semester.